I'm sure everyone has seen something like this before. 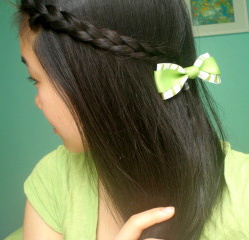 A 1-inch braid tied off with a clear elastic and pinned back with a bobby pin. It's something I've learned to master in less than 45 seconds flat, which is pretty handy if I'm rushing out of the house or my hair needs a quick update or fix during the day. Here I'm wearing a green bow, but what's great is I can put any hair accessory to dress it up and make it look a little less boring. Do you have any quick, easy hair that gets you out the door in less than a minute? Tell me!